Traditional braces are known for being associated with teenagers, creating a social stigma around them. This can be reason enough for adults to settle for their crooked smile or poorly formed bite. As the name implies, orthodontic aligners are designed to be transparent, allowing for a more discreet orthodontic experience. The thermoplastic material is strong enough to shift teeth into a straighter position, but thin enough to do so without friends, family, or co-workers from noticing that you’re wearing them nearly 24/7. This makes them ideal for adults who have already established a professional image and don’t want to change that just for a straighter smile. With this in mind, it’s important that patients take proper care of their aligners to avoid accidentally scratching, cracking, or otherwise damaging them. This can reduce their invisibility and make your treatment more obvious. Traditional braces require a high level of commitment, which is why they’re ideal for younger patients who may forget to wear their clear aligners on a daily basis. However, it also requires them to make changes to their eating and brushing habits to avoid interruptions in treatment. 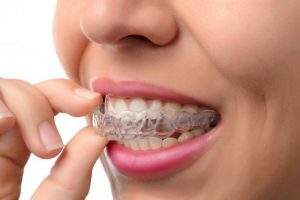 Since Invisalign allows patients to remove their aligners, they don’t have to worry about buying new dental tools to brush, make changes to their technique, nor make modifications to their diet just to pursue treatment. All they need to do is remove them for meals, during oral care, and whenever they want to take photos. As long as patients keep them in their dedicated case, keep them clean, and commit to wearing them 22 hours a day, they can achieve a straighter smile with more convenience than ever before. On average, traditional braces require a minimum of approximately 18 months before any substantial results begin to show. They also require many dental visits so the metal components can be tightened, effectively shifting the teeth. Because Invisalign is designed to treat mild to moderate levels of misalignment, they don’t require nearly as much time to complete. Depending on the severity of your case, you can complete Invisalign treatment in 6 to 18 months! You also don’t have to visit the dentist as often since the entire series of aligners is created at the beginning of treatment, allowing you to progress more independently. Fewer doctor visits means less money and time spent at the dental office. Ready to straighten your smile more conveniently? Schedule a consultation today to learn why Invisalign is superior over braces in Arlington Heights! Dr. Ernie Costello earned his dental degree from the West Virginia University School of Dentistry. 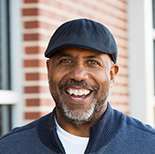 Since then, he’s become an Invisalign Preferred Provider, meaning he treats at least 10 Invisalign cases a year. To learn more about his practice, contact him through his website.